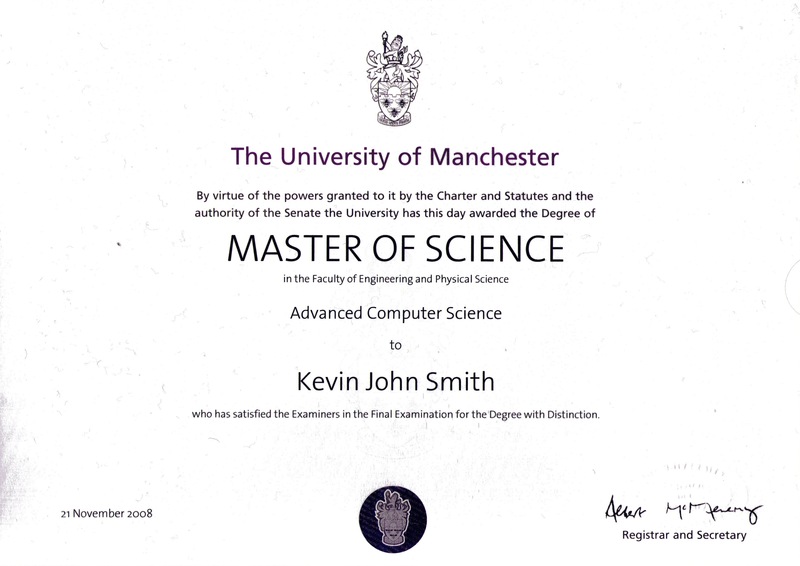 Downloads for project in Axiomatic Translation of Modal Logic 2007/8 Manchester. 1. On-line interface for SPASS with Axiomatic Translation - Try the software here!!. 2. Download pre-compiled binaries of SPASS with Axiomatic Translation of Modal Logic to run on your local machine. 3. Download the web-based interface for SPASS with Axiomatic Translation to install on you local machine. 4. Download the code for SPASS with Axiomatic Translation to compile and run on you local machine. 5. For developers - download the JAVA test system for SPASS with Axiomatic Translation. 6. My dissertation is available here. MANCHESTER SERVER is back ON-LINE! Note:This version of the SPASS interface has been designed to interact with the Firefox browser. In some cases Firefox will inappropriately cache data from an older version of the software - so if you have been using an older version, you are advised to "clear private data" in Firefox. You are recommended to use the default fonts in Firefox (a note of these is made below). Examples of usage are available in the SC (sample scripts) tab under the Misc dropdown. NOTE: If at all possible, you are recommended to download the latest version of the code from the link below, and compile it yourself. These binaries are only provided for the convenience of those who don't have compilers installed. (Other binaries for different versions of the software and for different operating systems can be provided on request). The binary for Mac 10.5.1 Intel is v1.1.0 HERE. The binary for Mac 10.3.9 PowerPC is v1.1.0 HERE. The binary for Fedora Core Linux i386 is v1.1.0 HERE. The binary for Windows 2000 / XP running Cygwin is v1.1.0 HERE. The binary for Solaris 5.9 is v1.1.0 HERE. The beta manual is HERE. The interface code v.1.1.2 is HERE (Please take note of the copyright notices included). The interface code v.1.1.0 is HERE (Please take note of the copyright notices included). Code for v1.1.2 extensions to SPASS (in C) is HERE (Please take note of the copyright notices included in eml.c). Code for v1.1.1 extensions to SPASS (in C) is HERE (Please take note of the copyright notices included in eml.c). Code for v1.1.0 extensions to SPASS (in C) is HERE (Please take note of the copyright notices included in eml.c). Code for v1.1.0 extensions to SPASS (in C) with modifications to perform the experiments described in chapter 8 of the dissertation is HERE (Please take note of the copyright notices included in eml.c). Fixed handling of input formula of format and(X,X). Now interpreted as X (not and(X)). Modified comments in code to remove OS dependence. Logical Not now represented by ! Modified semantics of conjectures and axioms: axioms alone define global satisfiability mode; conjectures alone define local satisfiability mode; both axioms and conjectures define local satisfiability mode. Added flag to allow global and local satisfiablity to be chosen. Deleted flag allowing composition in axiom 5 to be turned off. Jasper is provided as a NetBeans 6.1 (www.netbeans.org) project file. The tests execute from Main.Java (in the root directory of "jasper/src"). Jasper runs a comparison with the extended SPASS executable. You will need to edit jasper/src/main/Run.java to point to your executable for extended SPASS, and to the templates downloaded from the link above. The output is printed to 'standard output' and into log files in the directories logs, logs2 & logs3. Original Paper by R.Schmidt et.al: pdf here. MSc Presentation: Slides here. Tables here . (Previous drafts of these files: Abstract , Materials&Methods , Introduction , Axiomatic Translation , Specification , Implementation , Testing & Results , Results Figures , Discussion , Appendix , References). 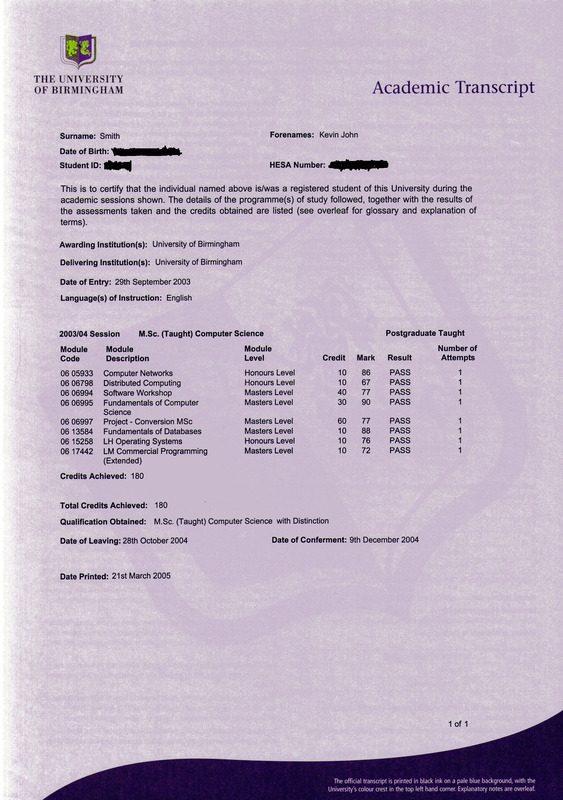 The Academic Transcript (redacted for security purposes). For Reference: This version of SPASS for Axiomatic Translation of Modal Logic Formulae is the first release. It is built on-top-of the latest 3.0 release of SPASS available. The original version of SPASS WITHOUT Axiomatic Translation of Modal logic is HERE. Downloads for project on Patterns IDE 2004/5 Birmingham (in Java). Dissertation: An MDA Tool in JAVA: The Patterns IDE ... 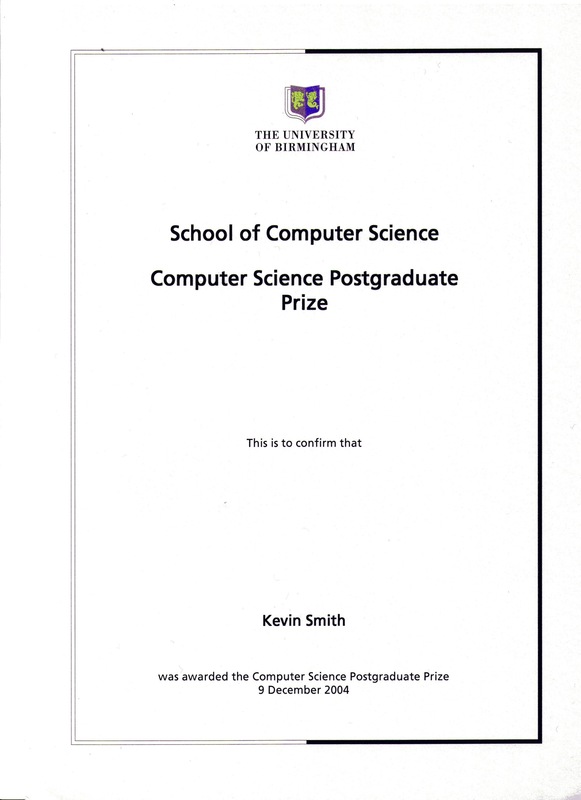 Here (45MB Scanned PDF - original text has been lost - sorry!). 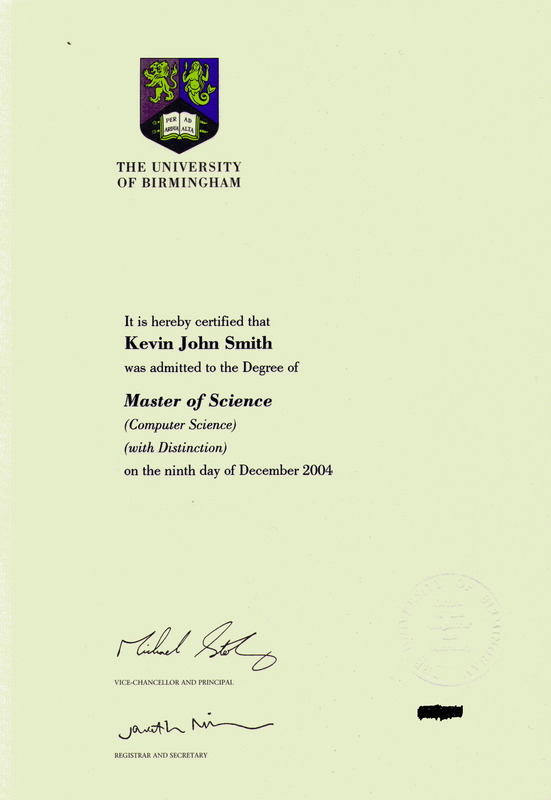 Degree Certificate (redacted for security purposes). Academic Transcript (redacted for security purposes). Miscellaneous Excersies from MSc level courses in Computer Science (under construction). Univ. Manchester Adv. MSc - Machine Learning - Matlab exercises. Univ. Manchester Adv. MSc - Machine Learning project. Univ. Manchester Adv. MSc - Automated Reasoning Part 1. Univ. Manchester Adv. MSc - Automated Reasoning Part 2. Univ. Manchester Adv. MSc - Semistructured Data & XML. Univ. Manchester Adv. MSc - Advanced DataBase Technologies. Univ. Manchester Adv. MSc - Knowledge Representation & Reasoning.